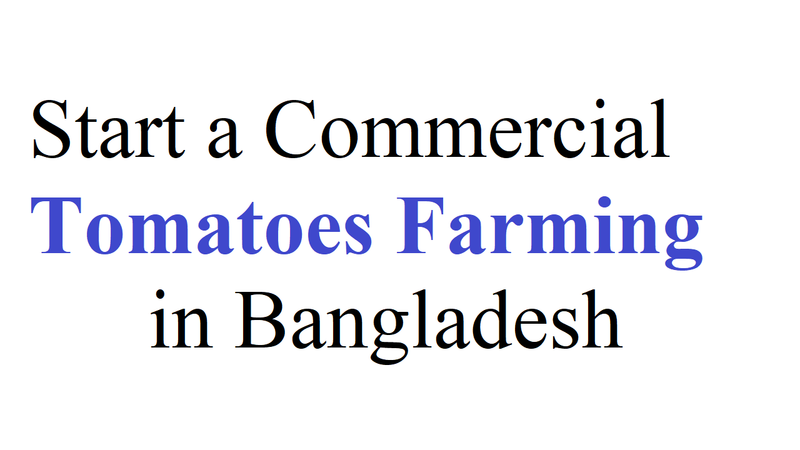 Commercial tomatoes farming in Bangladesh is not only profitable but is a rewarding and inexpensive business as well. It requires just 2/3 months to harvest and profits when you turn your garden into a money-maker with these tasty treats. As more and more people discover the exceptional taste and flavor of tomatoes, the sales are booming. Although a tomato farming business is a rewarding business that is not too expensive to start up, before you start your tomatoes business, find out what kind of tomatoes people usually want. Also, you would need to have a vision of what you intend to achieve with your business to be successful at your tomato farming business. In addition, and before they can make their business become a success, any successful entrepreneur starts by envisioning success. But, you would need to provide room for the business to grow especially as regarding the infrastructure you would need for your farm for your tomato farming business to grow. In Bangladesh, there is always a great demand for tomatoes. This is because this is the product that is eaten by more than 100 million people of Bangladesh. On the other hand, there are a lot of health benefits of tomatoes that inspired people to eat it. As tomatoes deep red, it means that it’s a very good source of antioxidant agents. Also, enhancing the health and sharpness of the eyes, it’s a powerful source of vitamin E. and if you talk about its nutrition and health, you’ll never go wrong with tomatoes. A commercial tomatoes farming business needs to maintain a lot of processes if you want to be successful. From a sufficient land to harvest and process your tomatoes, there are some steps to follow. Moreover, it will be very important for your tomato farming business while having additional storage. But, you might fail because your business plan did not account for it if you didn’t envision the potential for your tomato farming business to expand. Well, let’s know the steps that need to start a commercial tomatoes farming business. It’s a well-judged business plan that you must make before starting a business that you are serious about, and that you intend to make a profit from. While you’re thinking about commercial tomatoes farming business, it’s not something you just decide to start off without carrying out the necessary investigations that would ensure that you have knowledge of what you are going into. You should include all the things that you find while researching and investigating in favor of a solid business plan. If you have never done farming before then a commercial tomatoes farming business might be something different from what you are used. Although most people have the idea of starting a tomato farm, never do, which might be due to a lot of things which always includes finance. But, you would need to have carried out your research, and ensure that you would put in the necessary hard work that is required before you can get financing for your tomato farming business. From your planning to expert advice, everything goes vain when you’re in lack of finance. This is because most horticultural crops, including tomatoes, are usually capital intensive. Also, it requires a significant amount of time and energy apart from money. If you intend on taking the business seriously and view it as a successful venture then the location you intend to use for your business is very important. You probably would need to buy acres of land on the outskirts of town if you live in a busy one to get a farm for your tomato business. But, you might after analyzing the soil and determining it healthy for planting start your tomato farming business if you live in the countryside and have a whole land just sitting vacant doing nothing. In case, you might consider leasing the land till you raise the money town the land, or look for a fellow tomato farmer if you don’t have the necessary budget to purchase a suitable land. A commercial tomatoes farming business does not only need a huge capital but it’s an intensive labor project. And even if it is on a small scale you need tools to plow, plant, weed, keep the plants growing, and eventually harvesting your tomatoes. But, you might be able to get this equipment for fairly use from farmers if you’re lucky enough. And try to get some of the equipment from local hardware shop according to your needs. You would need to conduct a market research before marketing strategies. It’s the best to determine the best ways whether you could use to generate money for your tomato farming business. If you stick to a particular variety or even few varieties it might be more profitable.